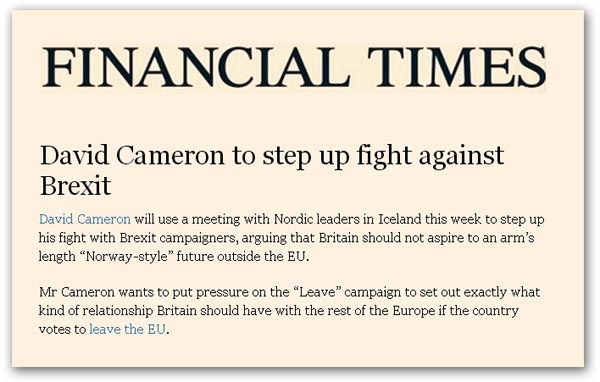 David Cameron, we are told by the Financial Times and others, is to use a meeting with Nordic leaders in Iceland this week to step up his fight with "leave" campaigners. He is to argue that Britain should not aspire to what is called an arm's length "Norway-style" future outside the EU, taking the chance to argue that Britain would end up having the worst of all worlds if it adopted Norway's approach to the EU. We are also informed that Mr Cameron wants to put pressure on the "leavers", challenging them to set out exactly what kind of relationship Britain should have with the rest of the Europe if the country votes to leave the EU. And alongside this, we have had Will Straw writing to the Second Cummings and Arron Banks, demanding to know whether they are backing the "Norwegian model". This should come as no surprise to "leave" campaigners. It is entirely natural and expected for the other side to quiz us on our alternatives to the EU, and for details of how we expect to manage the exit process – an exit plan by any other name. As to Arron Banks, we have yet to have a definitive statement from him, but the Second Cummings has already set his face against having an exit plan, mainly on the grounds that his fragile coalition cannot agree to what should constitute the plan. Lacking unity, they would fall apart if pressed on this issue. Instead, Cummings has come up with the particularly stupid idea of leaving the government to come up with an exit plan, and then calling for a second referendum to agree the plan, or reject it if it does not meet with our expectations. In typical Cummings style, he has not thought this through – but then it is only a political device aimed at overcoming that lack of unity amongst his own supporters and sponsors. Cummings knows full well that if he settled on a single plan, some of his major sponsors would walk out. As time has passed, however, the original reasons for Cummings's choice has become obscured, leading to the confusion charted by Mr Brexit over his true intentions and those of his business partner, Matthew Elliott. Nevertheless, a stupid idea remains a stupid idea, whatever the reason for it, leading Mr Cameron to authorise a carefully worded statement declaring that "Britain will not hold a second "In-Out" vote on its membership of the European Union if the public opt to leave the bloc at a referendum due by the end of 2017". This, of course, does not rule out a "treaty lock" referendum in the event of a "remain" vote followed by a new treaty, and neither does it exclude the idea of a referendum on the outcome of any Article 50 negotiations, should we vote to leave the first referendum. That was the original framing for the second referendum, as set out in Flexcit, where the idea was that we should campaign on a clearly defined exit plan, on the basis that this should be adopted by the government in its Article 50 negotiations. The referendum would then be a way of keeping the government honest, holding a veto over it, if it strayed too far from the script. With Cummings having rejected that proposition, though, and Arron Banks yet to declare, we still do have Flexcit, except that establishment campaigners are determined to claim the debate for their own, and exclude the input from anyone outside their bubble. In Flexcit, we make it clear that the "Norway Option" is only one of three possible options in the first stage of a six-point extraction plan, any one of which will help ensure a smooth, trouble-free transition from full membership of the EU to our return to an independent nation. In all events, whether we adopt the Norway Option or some other stratagem, this will only be an interim phase in our carefully structured extraction plan. This will ensure that there is no disruption or adverse economic consequence arising from our journey to freedom. And the eventual outcome is participation in a genuine, Europe-wide single market, and thence in the global market, where the UK stands to make huge gains from rejoining the world trading system as an independent nation. With links collated by White Wednesday, this more than adequately answers the points put by Mr Cameron and the BSE campaign, which is another reason why they are so anxious to avoid it. But if we can easily respond to such challenges, unless the other two "leave campaigns" adopt Flexcit or something very like it, they are going to have considerable difficulty reassuring the voting public that they have thought things through. That Mr Cameron is this week preparing a "challenge" on the Norway Option illustrates their inherent weakness in not having coherent exit plans. And this did not need to have been this way. In June of this year, I offered Cummings a deal on Flexcit, which he did not take up. Not so much chickens as Flexcit is coming home to roost, it seems. Booker: A Very Last "Last Word"